The Maine Masonic Civil War Library & Museum is located on the third floor of The Portland Masonic and is a full library dedicated to those Maine Masons and other individuals who served during the Civil War, whether at home, on land, or by sea! The Maine Masonic Civil War Library & Museum has been a project underway by director James E. Dufresne for several years. Recently, the library opened it's doors to the public! 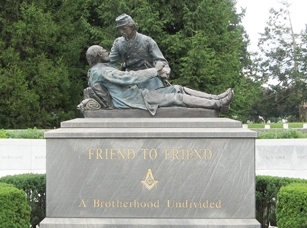 The library is a great resource for information on American, Civil War, and Masonic history. Home to hundreds of books and exhibits, you can find anything from Freemasonry for Dummies to ammunition used on the battlefield right before your eyes. Come visit, find a good book, and grab a seat by the fire (yes, we have a cozy fireplace). Right at The Portland Masonic!